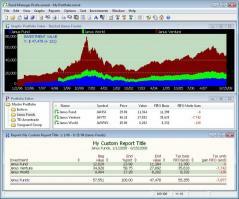 Fund Manager Professional is a feature-rich software solution for monitoring, management and improvement of accounting skills providing the possibility to create a database containing investments, generate reports and analyze graphs. The tool will welcome you with a friendly wizard at launch, which prompts you to enter the name of the portfolio, as well as account number and memory. Transactions and positions can be acquired using online retrieval mode once you fill in the user ID and password, sender name and account number. Also, Fund Manager Professional can be set to retrieve just the transactions, positions or both. To add a new investment to the database, you will need to enter relevant information like the asset and investment types, payment frequency, asset type, coupon rate, opening data and a few more. There are also multiple types of graphs you can analyze, plus you can see hidden investment and portfolios and generate various reports.